Exceptional birdlife, misty mountain vistas, and stunning orchids, all washed down with a locally grown cup of coffee. The Colombia Coffee Region offers more than just plantations and coffee related experiences, although there are plenty of those to be had for those who want them. The mild climate provides the perfect break from the coastal heat and humidity, while the quiet rural landscape presents an escape from the bustling major cities. For our first trip into the heart of the Colombia Coffee Region, we teamed up with Colombia Eco Travel to discover why UNESCO designated the Coffee Cultural Landscape of Colombia a World Heritage area. They guided us through the following hidden gems with a diverse itinerary of experiences taking us beyond the oft-wandered tourist path and offering authentic opportunities to connect with locals. Disclosure: This post is sponsored by Colombia Eco Travel. All opinions are my own. Salamina is a small rural town founded on a mountain top at a commercial crossroads between major cities. The town is recognised as one of Colombia’s 17 Pueblos Patrimonios (heritage towns) and has a reputation for its fine wood carvings. Much of the town’s elaborate wooden doors and architectural details can be traced back to the work or influence of mid-19th-century carver and cabinetmaker Eliceo Tangarife, who opened a woodworking school here. As we wandered around the pueblo led by our local guide Felipe, one of the most striking things we noticed besides the beautiful streetscapes, was how some of the streets appeared to dive right off the ridgeline. At points, you could look down a side street so steep it disappeared from view after just a block, and moments when it seemed roads would lead right into the clouds, like paths to heaven. Many people will see Colombia’s national tree, the towering Wax Palm, in the more familiar Cocora Valley. However, if you have a little extra time, the Samira Valley has 30 times more of these fascinating trees and about 30 times fewer tourists to share them with. While in the Cocora Valley, adult Wax Palms are all that are left because younger trees continue to be felled to maintain grazing land, in parts of the Samaria Valley the endangered palms are cultivated, nurtured and given room to grow in their natural habitat. In the Samaria Valley, we were introduced to a conservation project initiated by a local farmer, where young trees are given extra protection to help them survive their delicate youth. We hiked down into the valley where the trees grow in the native forest and got to see the palms at all stages of life. It’s hard to believe those 60m+ tall plants start out as tiny seedlings until you see it. They take approximately 150-years to reach full height and are vulnerable during their early stages. Not only did we marvel at the Wax Palms but the emerald landscapes themselves are impressive. There are also many winged treasures for ornithology enthusiasts to discover. Wax Palms and Eucalyptus together - making us Aussies feel right at home in Colombia! Of course, you can’t visit the Colombia Coffee Region without picking, sipping and sharing some coffee. 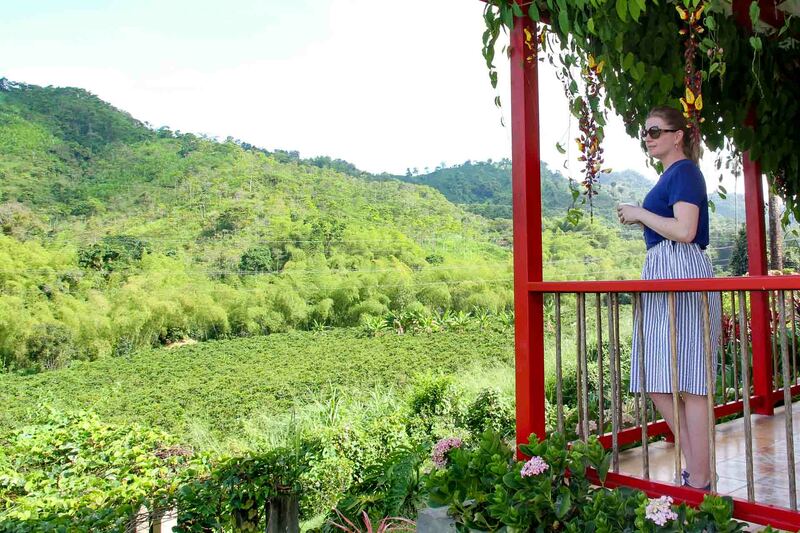 Hacienda Venecia offers three types of lodging on their 100-plus-year-old coffee farm so you can wake up among the beans and birds of this charming farm. We arrived late in the evening and it wasn’t until we woke up the next morning in the Coffee Lodge, that we realized the beauty of the farm around us. Your mind will boggle with the insight you’ll gain into your daily cup of coffee with the farm tour that takes you from crop to cup. We toured a coffee plantation in Jamaica’s famed Blue Mountain region last year, and yet we had so much still to learn! Hacienda Venecia grows and processes the coffee onsite right up to the roasting stage (roasting is completed in individual export locations to ensure it is to local taste), so we were able to see a much larger portion of the overall process. We came away with a much better appreciation of what goes into every mug of java including what factors influence quality and flavour. Next time we’re making time for the Cupping and Barista Workshop! Coffee and tiles, how could I resist? From the moment we stepped foot on José and Marisa’s family farm, Finca Romelia, we were treated to a verdant mountain vista set to a soundtrack of warbling birds. Our guide, Daniela, led us on an insightful tour down the steep hillside through fruit orchards and stunning orchids. We sampled exotic fruits picked directly from the tree, oohed and aahed our way through the fascinating collection of orchids, bonsai, succulents and bromeliads. José and Marisa have amassed a diverse collection of orchids largely through trading with other orchidists – that’s a word, I looked it up! They continue to experiment with new species and cultivation techniques, growing award-winning blossoms along the way. They have quite the trophy room of honours in their delightful centennial farmhouse. There on the terrace, we were served a delicious home cooked lunch while watching the hummingbirds and Andean Motmots in the surrounding garden. So many orchids I couldn't even begin to remember all the names! We took a much-needed digital detox with a night at Yarumo Blanco Lodge, inside Otún Quimbaya a flora and fauna sanctuary not far out of Periera. Accommodation is simple (note: no hot water), but the meals are fresh and hearty, and the bird-watching is terrific. We took a long, leisurely walk through the cloud forest with a local guide to discover some of the interesting plants and animals living there. Though the howler monkeys and tapirs eluded us on our short stay, the rain ensured we had one dramatic waterfall experience at Cascada los Frailes. The 70m plunge was torrential! It felt like you might get blown away if you got to close. In an instant we were soaked, the spray filled our rainboots and forced its way up the sleeves of our raincoats, but it was all in good fun as we felt the unrelenting force of nature up close. Who knew pink bananas actually existed?? Thanks to Daniel, Chris, Jane and the team at Colombia Eco Travel for revealing these hidden gems of the Colombia Coffee Region to us. If you are looking for an agency to help coordinate your trip through Colombia, I would recommend Colombia Eco Travel unreservedly. They proposed a great itinerary and took care of all the tricky logistics involved in getting around the less touristed areas of the Coffee Region, so we could relax and enjoy. They’re not shy of a rainbow in the Coffee Region, that’s for sure. I bet neighbours get quite competitive! What a magnificent hidden treasure of the world!! Inspiring blog and beautiful photography. Thanks Kath! We certainly weren’t expecting anywhere near the beauty and diversity of things to do that we found in the Colombia Coffee Region. It was really down to having a great local tour operator in Colombia Eco Travel, who could guide us to these lesser-known spots but equally fantastic spots.